Real account monitoring and set-file are available in comments. Before running the EA on a live account, test it in the visual mode. For any questions please send me a private message. The parameter entry - Reverse/Normal. If set to Normal, the EA uses the main logic for entries, if Reverse - it opens opposite trades, i.e. sell instead of buy. ‌Trading Direction - three values - Buy/Sell, Buy, Sell. 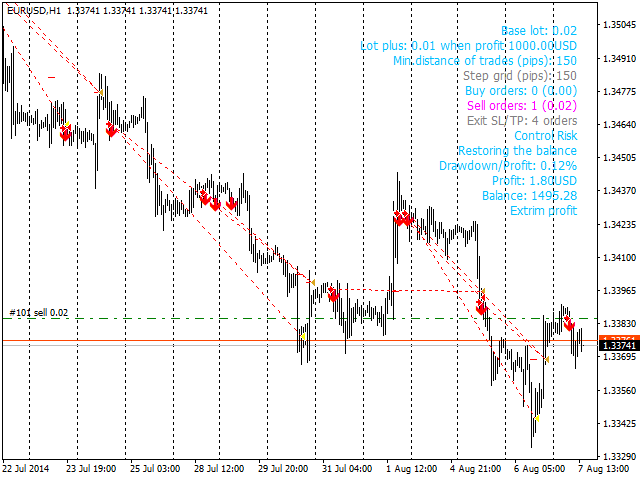 ‌Close part in this profit in pips - the aforementioned part of the trade will be close in this profit 0 - disabled. ‌The grid of pending orders - True|False - if enabled - disables the minimum distance - works with a grid of pending orders.